Romania has secured a place in the main round after the 24-29 victory against Germany. Cristina Neagu reached the all-time top scorer record (206 goals) after scoring 5 times tonight. The match started off better for the conducted by Ambros Martin. Good performances from Melinda Geiger and Denisa Dedu allowed the Romanians a 1-5 advantage after the first 5 minutes. The Siófok goalkeeper closed the first half with an outstanding 44% save rate (7/16 shots saved) and helped the team reach the end of the first period with a favorable score of 11-14. 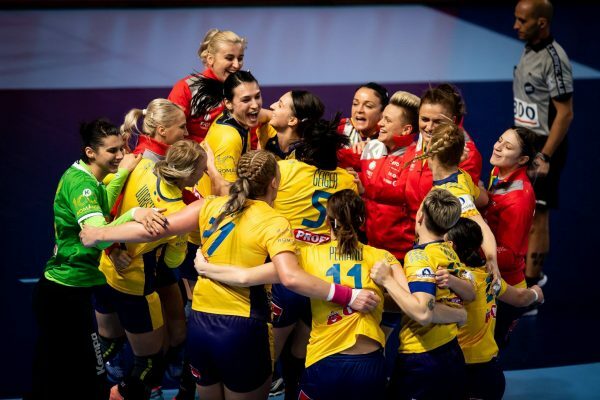 On the 26th minute of the first half, a milestone was reached as Cristina Neagu scored her fifth goal of the match, becoming the all-time top scorer of the EHF Euro competitions. 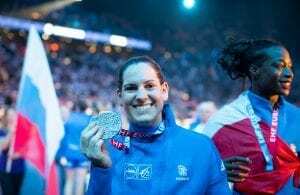 The Romanian star reached the impressive number of 206 goals to dethrone Hungarian Ágnes Farkas, who had been at the top of the top scorer list with 205 since 2002. A very intense defense along with an impressive performance by Dedu were some of the reasons why Romania were able to create a bigger gap during the second half. Things in attack were working fine, but it was the defensive phase that allowed them to play more loose in attack and be calm to extend the gap to 9 goals (16-25 at 18’) at one point. A 4 goal run for Henk Groener’s squad helped them catch up a little (23-27), but it was already too late as there were only two minutes left to be played. The best player of the match was Denisa Dedu, who finished with 13 saves out of 37 shots (37%). The top scorer of the match was Eliza Buceschi with 11 goals; on the German side, Julia Behnke was the top scorer with 8. Romania is now leader of group D in Brest and have secured a place in the main round, but they still have one match left on this stage. Norway is the upcoming rival, Neagu knows well it will be hard, but doesn’t think about it yet and enjoys the moment for now: “It’s going to be tough against Norway, as usual but I just want to enjoy the time feeling that we are having tonight because we did a great game against Germany and we won, so that’s all that matters for me at the moment. Looking forward to the competition we did a great thing today, we’re hoping to take more steps forward, beginning with Norway and going further in the competition”. Germany’s coach Henk Groener did not hide his frustration, however, he was optimistic about their chances to advance to the main round: “Today we didn’t find the solutions in the offense, so it seems. We missed three 7mts throws in the first half and some other free shots, and I think when we found the solution we didn’t score, and we run behind all the match, but we never gave up. I still have to compliment my players because, nobody really expected us to have 2 points after two matches, but we had a great match on Saturday, today we didn’t have the peace in mind to do the right things in offense and we were in the beginning too reluctant in defense. So for us it’s time to settle down a little bit and get prepared the match against the Czech Republic on Wednesday which will be deciding for us to go through the main round”.